Christmas is a very special time for everyone. For me it’s even more important as I live very far away from home and I get to see my family twice per year so Christmas being one of them is extra special. Christmas in my home is very traditional. My mum makes the same dishes every year and most of them we eat only once per year. The Polish Christmas specials include pickled cabbage and mushrooms dumplings, mushroom soup, red cabbage with bacon, at least 3 types of fish and poppy seed trifle for dessert. Every time I go home I get my very own window in food preparation time and get to prepare something without sticking to the traditional recipes. Because everything on our table is quite heavy I wanted to make a light dessert with something fruity that will yet still remain the warmth of wintery spices. 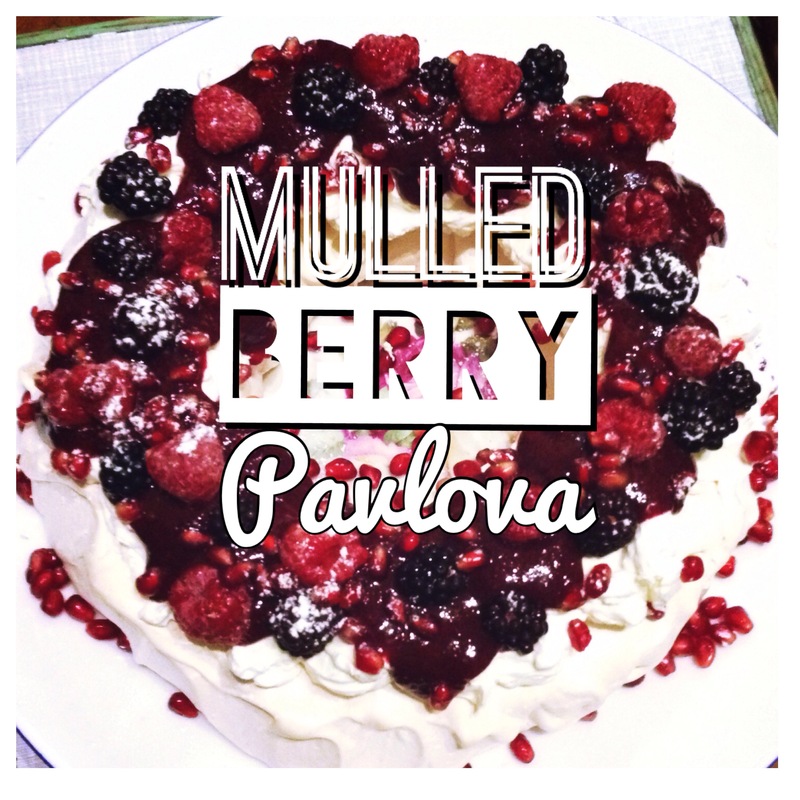 So I decided to make a mulled berry pavlova. 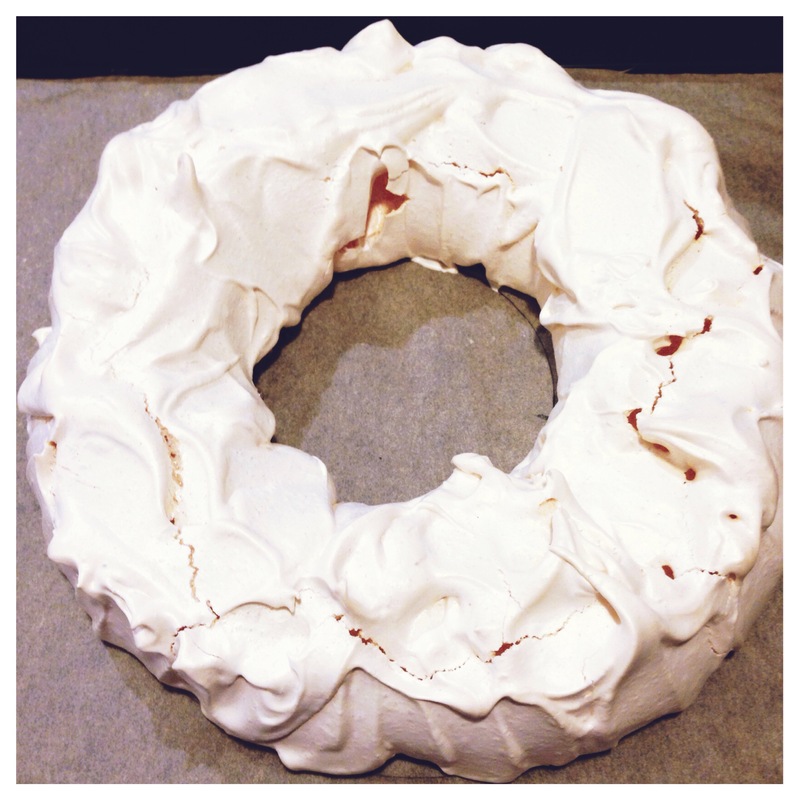 It has delicious soft meringue wreath covered with fluffy vanilla whipped cream and mulled berry preserve. 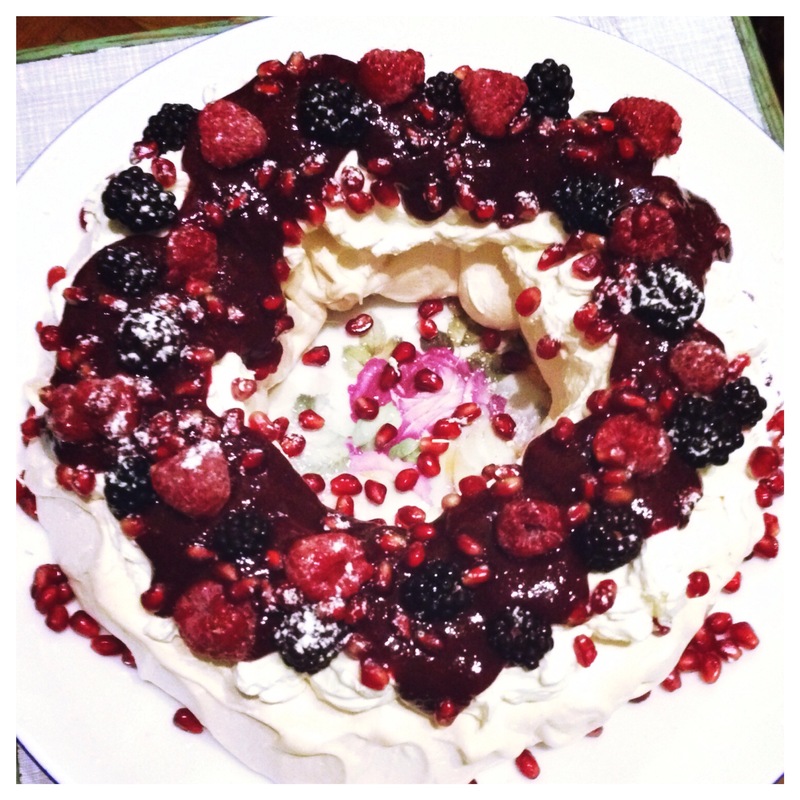 To coronate the dessert I used natures finest jewels: black berries, raspberries and pomegranate seeds. The recipe is really simple yet the moment you bring it in to the room it grabs everyone’s attention. You can prepare everything few hours before serving and keep it in the fridge or like me prepare the meringue and assemble it just before serving. Even if my mum lets me cook something less traditional it doesn’t mean I get a lot of space in the fridge to store things. What I also love about this recipe is that it really doesn’t cost much few egg whites, a bit of sugar and frozen or fresh berries. This dessert has three main elements that will require your attention. 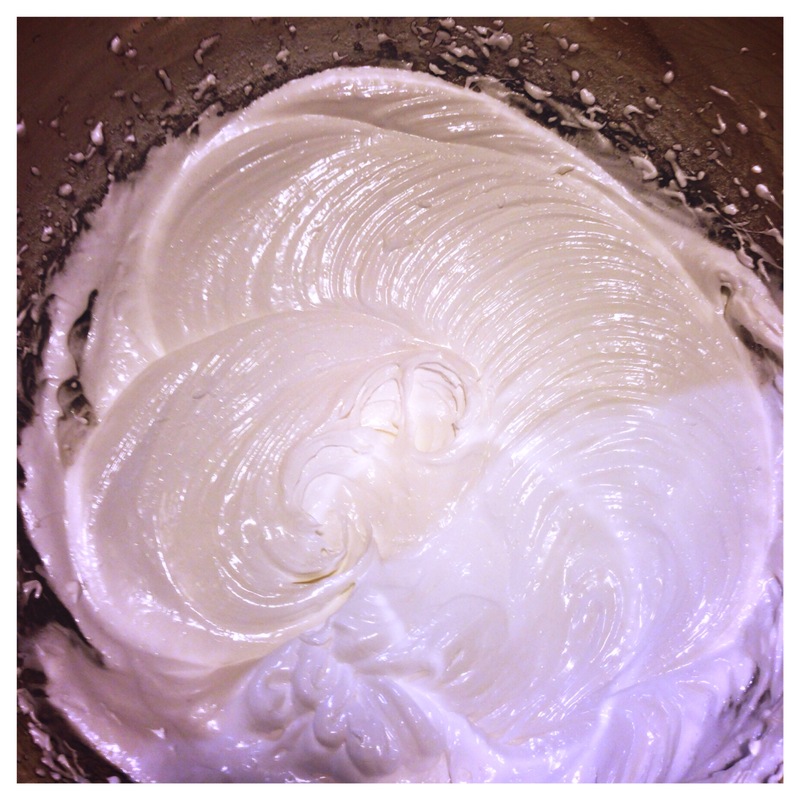 Firstly the meringue, then the preserve and lastly vanilla cream. 1. 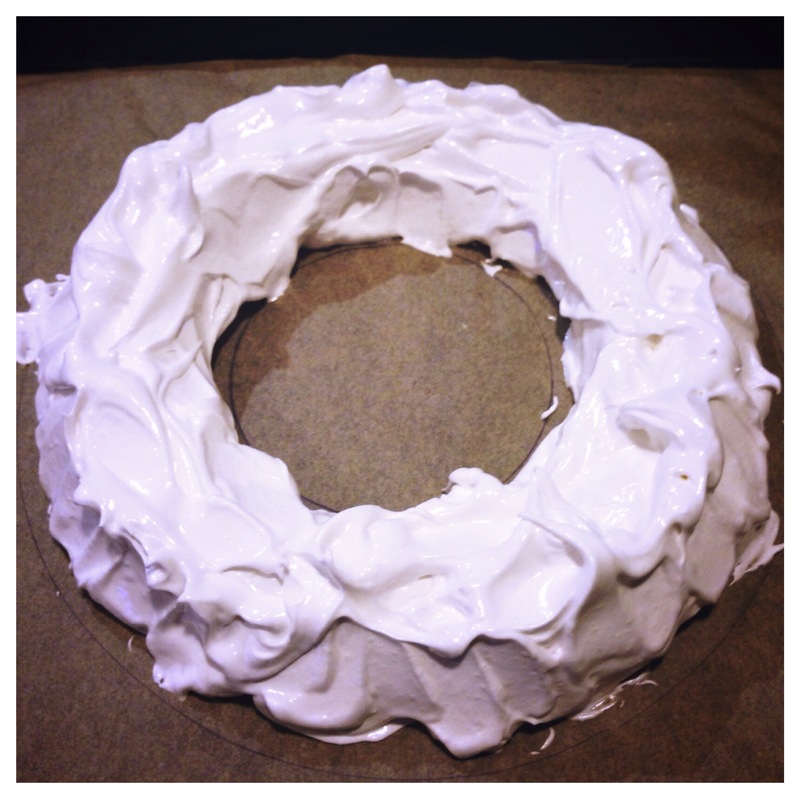 Line the tray with baking parchment and draw 2 circles that will help you make a perfect wreath. Preheat the oven to 150C. 2. Prepare your bowl (ideally metal). Make sure it’s clean and dry and degrease it with lemon juice or a little bit of vinegar and dry with kitchen roll. Add the egg whites and beat with electric mixer until they start to fluff. Keeping your mixer still on, add pinch of salt and sugar, carry on beating on the highest setting until hard peaks. Make sure you don’t do it too long because it will start separating. 3. Spoon the egg white mixture on the baking parchment forming a wreath with the help of your drawing. Bake on the middle shelf for 15 minutes in 150C then reduce the temperature to 140C and bake for further 45 minutes. Leave to cool completely. 4. 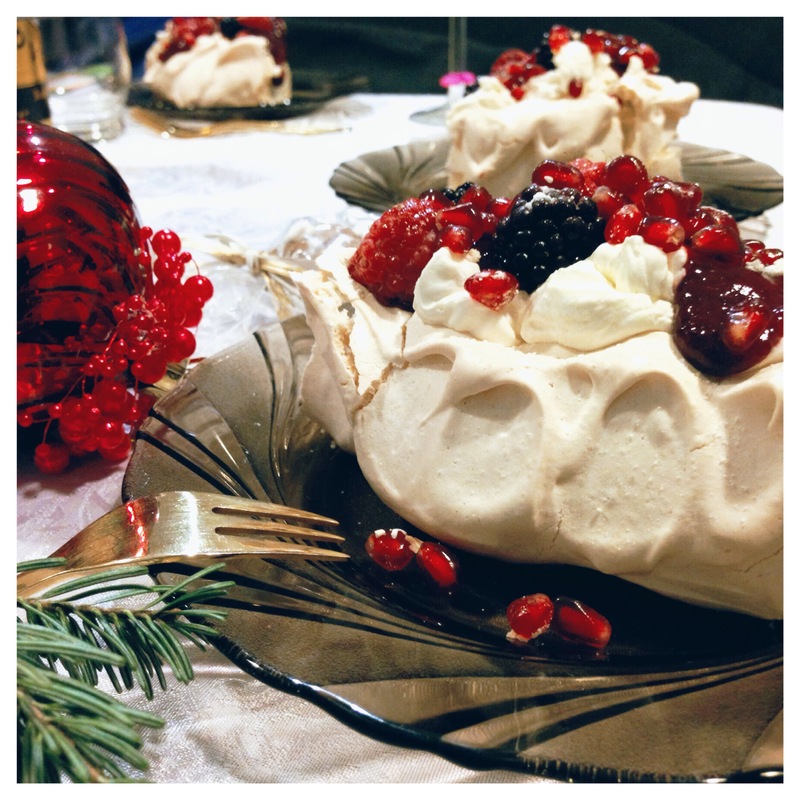 While pavlova is baking place all the jam ingredients into a smallish pot and bring to boil then simmer on medium heat for 20 minutes stirring occasionally. When you see the jam starts to thicken you can sieve it to make a smooth preserve. Don’t worry if it’s a little bit runny. It will thicken when cooled down and you don’t want it to be to thick. 5. Whip the cream with icing sugar and vanilla paste until thick and fluffy. 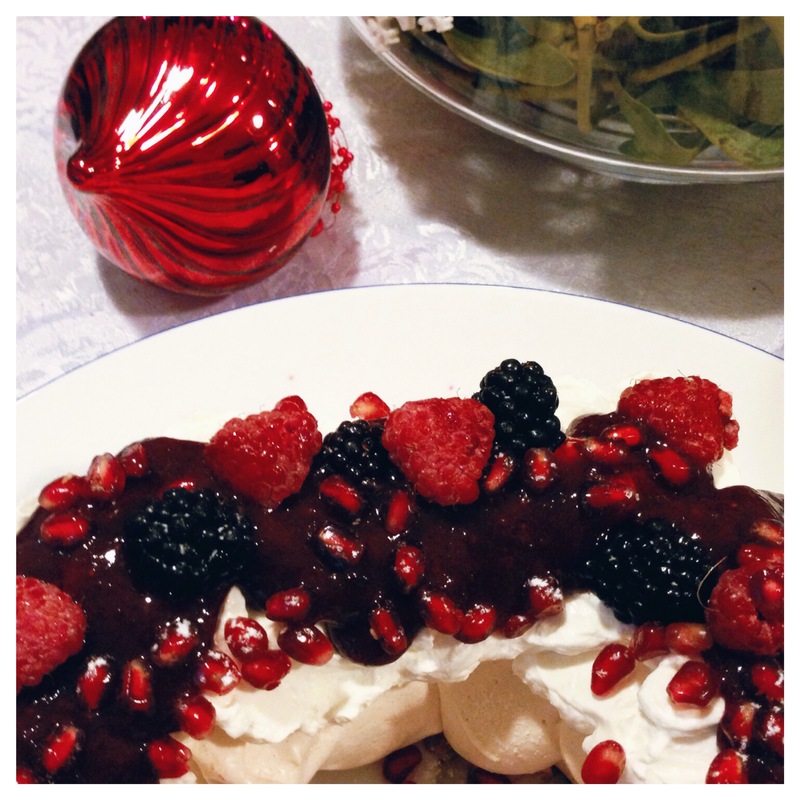 Place the meringue wreath on the serving plate then cover it with whipped cream, mulled berry preserve then fresh berries and pomegranate seeds on top. Dust with icing sugar before serving. You’ve done well! 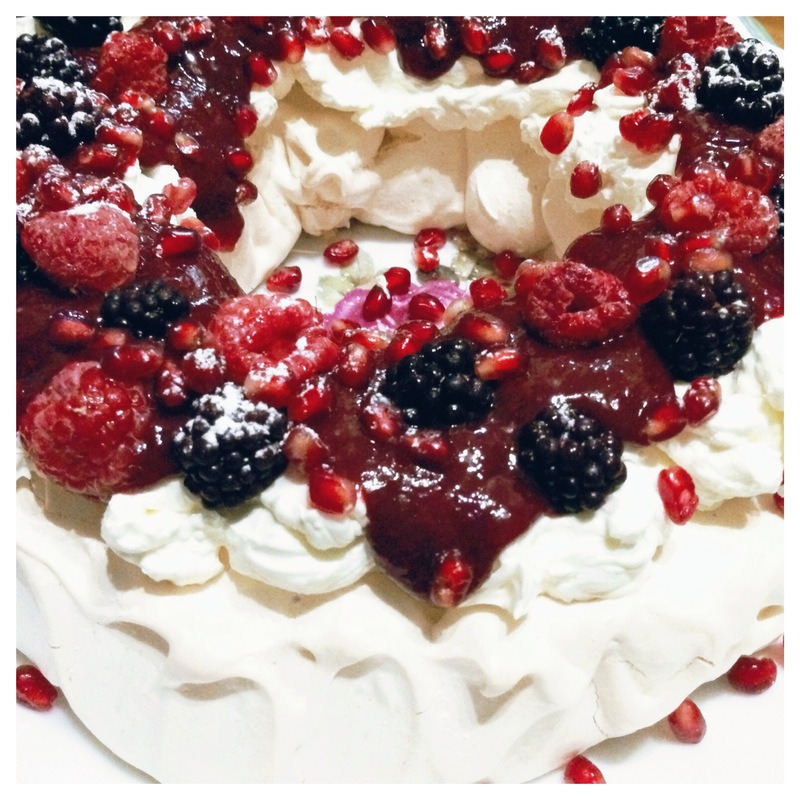 Perfect pav! Love the twist on things, you know I had a friend of mine make a bannofee pav at Christmas, all caramel, cream and banana topping. I’ve never seen that before either. Anyway, good work and hope you had a wonderful Christmas/new year. Thank you for your kind words… Well I figured a secret with pavlova that if you make it a wreath shape there is nothing to collapse in the middle :)…Haha omg Carp! It’s a traditional food in Poland too but it’s my childohood nightmare so i sint eat it!! You are brave for trying it!! 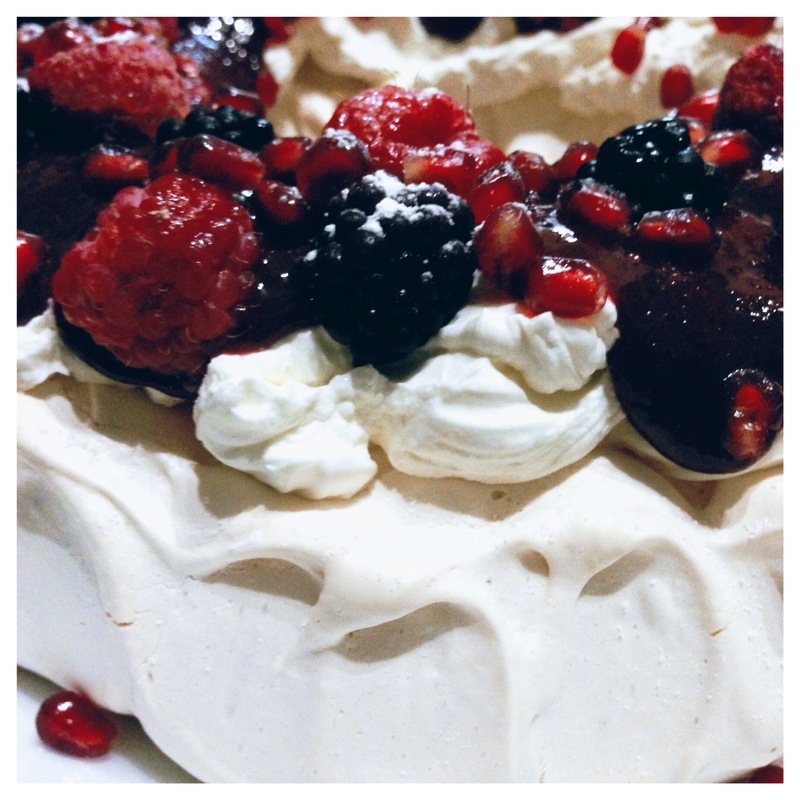 Thanks for stopping by my site and liking my own version of Berry Pavlova. 🙂 I love the mulled element you’ve added to the berries in your recipe – definitely worth a try. I can imagine that the spiciness works particularly well for a winter Christmas dish (unlike the heat we have here in the Southern hemisphere)! Thank you for the like of “Mom’s Recipe Box: Great-Grandmother Reeve’s English Plum Pudding”. 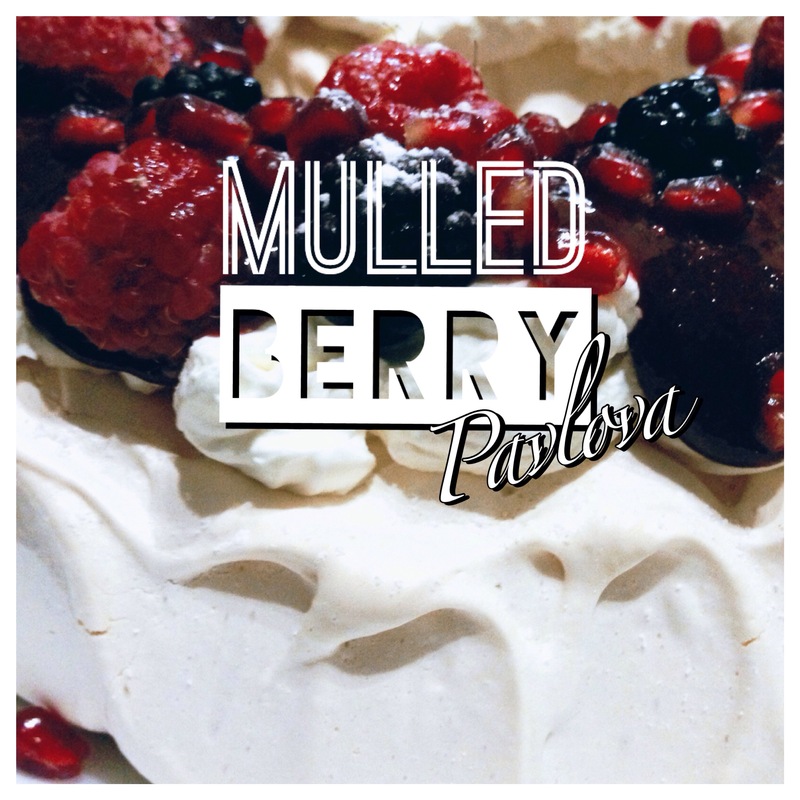 Your Mulled Berry wrreath looks interesting ….